Reuniting with Sevilla coach Manuel Jiménez, José Carlos gained his form, and some versatility too - whether in central midfield, the wings or just behind the striker, José Carlos was playing with a renewed vigor. He scored four goals and assisted six more as AEK qualified for the Europa League, but were denied a license to play due to financial difficulties. Those difficulties saw 30 players leave the club - José Carlos was one of them. And Rayo picked him up. The good form continued, and he played in 32 league matches. The trickery that made him successful at Sevilla was back again - whether it was the right wing or the left - he dominated it. His first season saw Rayo reach eighth and qualify for the Europa League and, in a sense of déjà vu, were denied a license to play due to financial difficulties. Anyways...it was the first game of the 2013-14 season, and Rayo were dominating Elche. José Carlos was making Elche sweat. The 36th minute of what would eventually be a 3-0 win, and it looked like he had sprained his knee - he was taken off anyway - but nothing looked serious. On 19th August, 2013, Rayo thought it was a knee sprain. On the 21st, Rayo knew it was something much worse. José Carlos had torn the anterior cruciate ligament in his left knee, and that surgery was required. The knee that had blessed him with speed and agility would now come under the knife - on the 23rd, the surgery was complete. A long, arduous recovery process followed, which saw José Carlos only return to the pitch on the 26th of March, 2013. After seven months out, he was going to grace the pitch for 23 minutes against Osasuna. Rayo were 0-0, and looking for a win. And José Carlos was the match winner. Receiving the ball on his left foot, he got past right-back Oier with a lovely piece of skill, was pulled down when Oier pulled at his clothing, and a penalty was awarded. In the last minute of the match, striker Joaquín Larrivey made no mistake. 1-0. It was an immediate recovery. There was hope that José Carlos could contribute something more to the team. Three days later, José Carlos treaded on the Bernabéu, as Rayo faced city rivals Real Madrid. He whipped in in dangerous set-pieces - both free-kicks and corners. He gave Marcelo a hard time on the right wing. And he made sure his time on the green, lush grass of the Santiago Bernabéu was worth it. Fate doesn’t think that way though - he came on in the 23rd minute for Rubén Rochina and left on the 79th minute of a 5-0 defeat for…no one - Rayo had exhausted their subs, and more importantly José Carlos was injured again. In his left knee. Again. This time, it was post-traumatic synovitis, caused by inflammation of the synovial membrane. A good translation would be swelling, pain and career-jeopardizing. Another recovery followed but he wasn’t going to give up so easily. His link with Rayo expired but newly promoted Córdoba give him a lifeline - despite him failing a medical at Depor - and a chance to fully recover. On the 25th of October, 2014, he was back. Again. At home against Real Sociedad, José Carlos played the last 18 minutes of a 1-1 draw - admittedly not much but the comeback was more important - he was back where he belonged. And then, predictably, almost with tragical certainty, José Carlos was back on the injury table. The cruciate ligament that had torn once had now been torn twice. Just five days into his comeback, and now he would be out for a year, possibly even more. Córdoba rescinded his link on the 13th of November, 2014. After three years on the injury table, and over a year of unemployment later, on the 9th of December, 2015, Llagostera signed the player for the rest of the season. He had trained for a month with the Catalan minnows, and coach Oriol Alsina was impressed by what he saw. Unfortunately, the left knee that has seen two ACL tears and a synovial inflammation, the left knee that terrorized defenders and the left knee that fully healed, will perhaps never grace the football pitch once again. 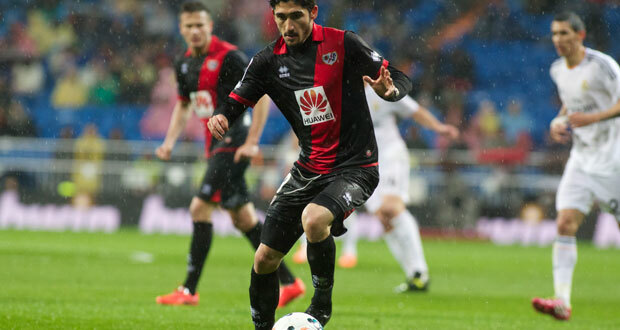 His season with Llagostera ended with relegation, and he spent the 2016-17 season with Gimnàstic de Tarragona. Scoring one league goal and providing another in 404 minutes, his highlight was scoring a 100th minute goal for the club against Numancia in the Copa del Rey, to advance to the Round of 32 stage. And now? He is without a club. Fate told him his talents would never fully blossom at the highest level. He was born in Minas de Riotinto - the municipality of Huelva where Spanish football was born too. And, ironically yet symbolically, Spanish football had left him behind.